Over the past few weeks I have made two trips to Denver, as mentioned in my previous post, - one to visit family and the other last week for work. During both trips to the Mile High City, I was pleasantly surprised to find that the knowledge of celiac disease and eating gluten-free is fairly prevalent. I always worry a bit before heading to a new location, or different part of the country/world, not knowing what the level of celiac awareness will be, but on these two particular ventures to Colorado I was very happy and excited with what I found! In my opinion and from my experiences, I have found that eating out at perhaps more "up-scale" restaurants seems to be a safer bet vs. faster food or even take out. I don't mean this to sound "snobby" in any way, shape, or form, but it seems that higher-end restaurants want to get it right and take more care with their meal preparation—now, I realize that this is by no means a 100% guarantee for eating safely just because you are paying more for your food, but from my experiences I have found that wait staff and chefs seem to be much more educated when it comes to eating gluten-free, under these circumstances. With that said, the two Italian restaurants that I visited in Denver were both terrific. Truly, one of the highlights of this week's business trip to Denver was discovering the restaurant Panzano, in downtown Denver on 17th Street. At first I was a bit alarmed with the limited "bar menu" we had to choose from given the time of day, but I quickly learned that our server was very educated on eating gluten-free. 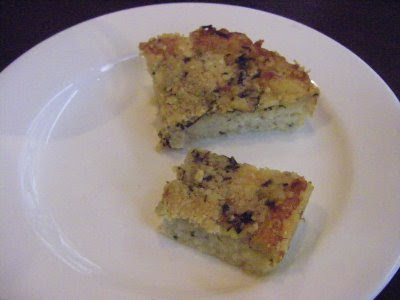 He guided me through the menu and went out of his way to create a gluten-free Caesar salad, and wonderful antipasti plate that was fabulous, but the best part of the experience was when our server asked if I would like my own basket of gluten-free focaccia bread! Uhhh, "what did you say?" I replied...I continued, "Are you SURE it's gluten-free and safe"...he responded "Yes, it is" and they do all the fresh gluten-free baking every day in their bakery that's designated for celiacs and not contaminated. In that case I said, "PLEASE bring me some bread! And wow, was it delicious—I ordered two plates! If you haven't already, on your next trip through town check out Watercourse Foods, on East 17th. They're a vegetarian establishment with many gluten free options. It possesses a nice, bright dining room and it's a very popular place and comes highly rated. The same owners also run the smaller "http://www.watercoursefoods.com/cityocity.html">City 'O City" cafe/bar on 13th, just a few blocks away. Its smaller establishment I'm told, with a more hipster crowd, and their wheat free pizza is terrific. 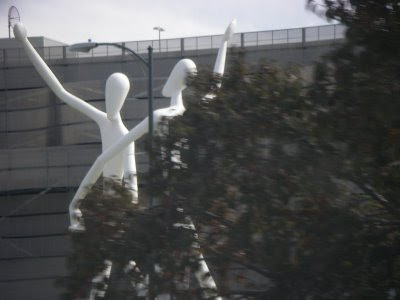 I've always wanted to visit Denver...and I'm not talking about just dashing through their uber-cool airport to make a connection - a real visit to the Mile High city to experience some of what it has to offer. My brother is working there temporarily for a few months, which provided me with the prefect excuse to use some miles for a nice weekend get-away, just in time to see the gorgeous fall foliage in all its many colors and shades of autumn, and I definitely wasn't disappointed! As a Celiac, there's always a bit of apprehension as to where and what I will find that's safe to eat when visiting a new location, but I did a bit of research and felt confident that Denver would be clued into what "gluten free" dining is all about...and I was correct in my assumption (phew!). So our first night out to dinner consisted of a lovely salad from the Whole Foods salad bar, just down the street from his apartment due to a very late arrival, but I'm happy to report all was well with that meal. Our second night out we walked to a fun restaurant called Ted's (as in Turner) Montana Grill, which is pretty Eco-friendly AND guess what...they have a gluten-free menu which came as a great surprise. I dined on a very delicious fillet (beef that is, because they do offer bison), a scrumptious sweet potato and grilled asparagus. The manager even came over to go through the menu with me, ensuring that I understood all of the dishes that were safe to eat and made sure I was comfortable, which was very kind. The third night out found us dining downtown at Prima Ristorante, in the heart of the theatre district. We found this lovely Italian restaurant on Opentable.com - love that sight for finding new restaurants, wherever you find yourself. The restaurant was great and offered a delicious and fairly authentic Italian menu with a warm and cosmopolitan feel to the decor and experience. Our server was from Belarus (as in the former USSR country, as she explained) and was very familiar with gluten-free eating and double-checked everything I ordered with the chef. She helped me decide upon an antipasti of roasted asparagus wrapped in prosciutto, with a chunk of dry Fontina cheese, drizzled with olive oil. 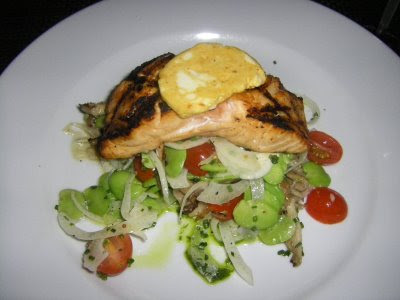 My "secondi" or entree dish was so fresh and delicious but could have used a tad more salt - it was a piece of grilled salmon over a bed of fennel and fava beans, with mushrooms and Roma tomatoes. Delizioso! A day trip to Vail was also on our list, so Saturday morning we grabbed our cameras, warm jackets and headed west to the Rockies. The fall foliage has just turned and the golden hues were breathtaking and endless. The 1.5 hour drive went by too quickly and there wasn't enough memory on my camera to capture all the orange leaves I needed to snap up. 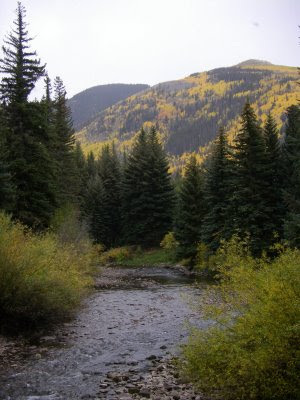 Vail was not what I expected nor what I had visualized in my head for years, but have no fear, no disappointment here. Vail is a quaint and Euro-village-like with a darling shops and restaurants that back right up to the lengthy slopes sliding down the mountain. 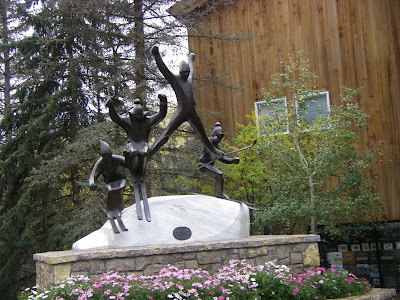 I was happy to find there seemed to be no "attitude" floating around Vail whatsoever. 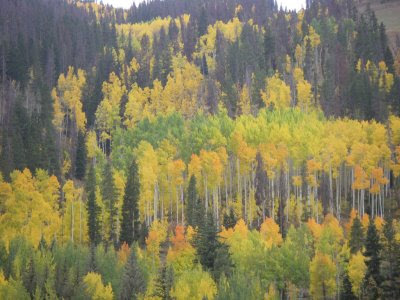 It felt quaint and comfortable, and surrounded by gorgeous fall colors dripping off the Aspens, while the crisp fall air began to settle into our bones. 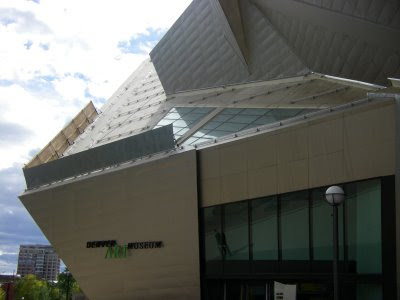 On Sunday, my last day in Denver, I convinced my brother to visit the Denver Art Museum with me. He's such an art afficianado...ha. Truth though, this museum is world class and very impressive. From the eye-catching and amazing sculptures all around the museum campus, to the beautiful clean lines of the museum walls, and the angles they create against the Denver skyline - wonderful. NOT to be missed! So, not only can you eat gluten-free and very well, visit gorgeous scenery, world-renowned ski resorts, and an incredible museum, but you can also just take a wonderful stroll around the town and take in some lovely sights in a very cosmopolitan city. In my case, the highlight of the trip was spending valuable time with my awesome baby brother and exploring a new city together. So great!